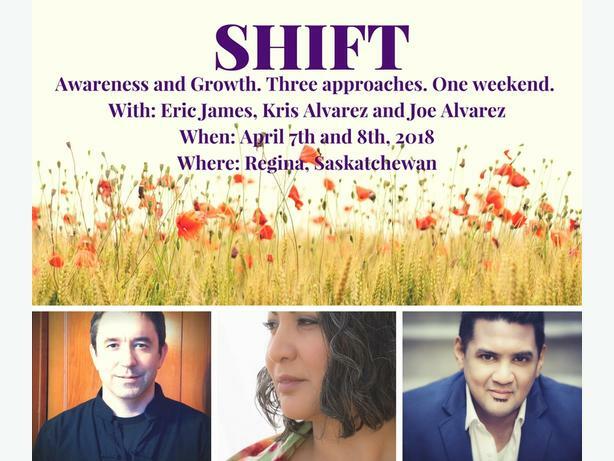 Join Kris Alvarez, Joe Alvarez and Eric James for an exploration of how three modalities can be used together to facilitate personal growth. To register for this event, please fill in the form at http://www.123formbuilder.com/form-3534112/SHIFT-REGINA. To reserve your spot, payment can be made via e-transfer to shiftregina@gmail.com, or by cheque delivered to 1953 Toronto St Regina S4P 1M9. Joe is a master coach and trainer in NLP, Timeline Therapy Tm and Hypnosis. He has coached and trained a wide variety of people helping them achieve their desired outcomes. He will be teaching tools on how to master the mind and its state in order to create desired experiences. Kris is a theatre artist + musician. Voice is an integral part of her artistic practice. Facilitating workshops for varied levels & abilities, Kris has a spirited curiosity about voice & the habitual limitations hindering genuine expression. During the weekend Kris will offer simple ways to explore sound, tone, breath in a safe, gentle and enjoyable way. Sifu Eric James has practiced two styles of Tai Chi Chuan in addition to several Chi Kung sets for over twenty years. He is currently head instructor at the Prairie School of Tai Chi Chuan. For this weekend, he will be guiding participants through various Chi Kung techniques with the aim of cultivating the skills required to release tension and blockages in the body and so allowing better health and temperament to find space.